This year, I promised to sprinkle #BlackGirlMagic everywhere. Dedicated to doing so, I recently had the honor of speaking to dynamic women across sectors and industries; all of which were diverse in background and age. These women were in a career development program with Dress For Success (DFS), the worldwide non-profit organization that is dedicated to empowering women to “achieve economic independence by providing a network of support, professional attire, and the development tools to help women thrive in work and in life. DFS is located in 160 cities and in 30 countries and has helped more than 1 million women secure work to become self-sufficient. Much of the DFS’s success is due to engagement of volunteers and I was grateful to be a part of that this week. I admire and look up to the organization's CEO, Joi Gordon, who has said to ABC News, “When you marry your purpose and your passion, you could just about do anything." Joi reiterates something that I spoke to the women about this week, to never “wait for other people to see the value in you,” instead, make your value be known, communicate it, and back it up with in practice and in writing through such tactics as a brag sheet. I also told the fabulous women to go above and beyond what’s asked of them, which is the best way to stand out and grow. Joi and I both agree that it comes down to showing up and showing out. That means to, “show up for new assignments, ask for opportunities, reach across departments, and do work in other spaces; even if it isn’t your job." Never stop learning your craft and you should be on LinkedIn more than any other platform. Don’t just look around, post about recent news, industry updates, respond and engage. It’s imperative to stay on top of updates in your respective field. At the event, I was asked to explain what an informational interview is. It’s an interview just to get to know someone, not for a particular job. Your goal is to impress the person within this limited time frame so that they’ll become an advocate for you and in return introduce you to others in the industry. It should be a ripple effect that every time you meet with someone, you end up with new contacts and grow your rolodex of industry contacts. Always be on the lookout for the #RippleEffect! You should know the difference between a mentor and a sponsor. A mentor is someone who coaches you and gives you career advice. They do not have to be in your same field. A sponsor is someone who has the ability to make a phone call and get you a job interview, or can speak to someone to aid you in a promotion or raise. They’re an effective go-getter advocate, vs. a coach (mentor). If necessary be open to temp work, internships and fellowships. Your resume should be updated at all times. Yes, all times. It is a part of your job to update your resume, and to have a brag sheet/work journal, where you highlight every single one of your wins, as well as all of your new skills and new work that you’re taking on. Learn something new, update your brag sheet, learn a new skill, update your brag sheet. Then, when ready to ask for more money, a promotion, or anything in that realm, you’ve got the document in writing to show for it. You should always be able to identify how you have recently gone above and beyond your job title and responsibilities. Be irreplaceable! Every industry is always changing, from time to time have conversations with those leaving college and entering the workforce, they probably have really cool resume designs. I know they do as I work with both undergraduate and graduate college students daily. Stay up-to-date, always. 6. Don’t forget about job boards, career sites, social media, headhunters and recruitment agencies...oh and never stop networking – Meet people and then some more! People need to know you more than you need to know people. Go to networking events, contact your college’s alumni office, reach out to people on LinkedIn for good reasons only. And don’t forget the power of leveraging your family and friends to help you on your job search. You find a job online, wonderful, now go and make a connection to a real person who works there. Be short and concise, share your resume with them. Do not waste their time, get to the point and be meaningful and memorable. Who are you and why should anyone take notice? What do you do and what can you learn to do? Where have you served before and in what applicable capacity? When’s the last time you’ve had this role or done this work? Why does the job need you? Why should the job hire you? How have you done it before (experience)? How will you get it done now (relevance)? Step 4: Never Give Up! I’m declaring the new year to be my “32nd Year of Magic” (paying homage to the jersey number that NBA legend, champion, entrepreneur and mogul Magic Johnson wore). My year of magic will include sprinkling #BlackGirlMagic everywhere I go. For those who need a quick reminder, #BlackGirlMagic is having the power to mysteriously influence events; to magically move, change and create. #BlackGirlMagic celebrates the resilience of black women who excel despite adversity -- which is what I will continue to do in the new year. I learned from Queen, Oprah Winfrey, that focusing thankfulness is magical and rewarding. "I live in the space of thankfulness — and for that, I have been rewarded a million times over. ...When you focus on the goodness in life, you create more of it," said Winfrey. Practicing Gratitude and Sharing Knowledge - Maya Angelou said, “Let gratitude be the pillow upon which you kneel to say your nightly prayer.” If you are really thankful you share. No one achieves success without some sort of help. There’s always a blessing in being a blessing. Here’s to obtaining more mentees, teaching great lessons and presenting at more speaking engagements in 2019! Being my own cheerleader when needed. Not everyone will clap for you, but I’ve finally learned that a group of cheerleaders are not needed for your purpose to unfold. You can be your own cheerleader. Not everyone is nice, or excited and happy for you. Not everyone wants you to win. But, it doesn’t matter! You do not need people to clap for you for your purpose to unfold. Focus on what’s next and most importantly, keep going! I cannot begin to count the amount of times that someone told me no, or literally laughed in my face when sharing a goal (especially ones that I’ve now accomplished). It may take longer than planned, but stay focused on what’s next and stay on task. I promise, it’ll be worth it. Don’t just dream, PLAN! In order to transform, continuous learning and growth is needed. Here’s to always finding new opportunities to learn regardless of how intimidating or out of the ordinary they may be, which is mandatory for growth. Purpose-filled evolving. Fear, intimidation, it’s all a part of the journey. The magic happens with you move towards your purpose and evolve accordingly. I have learned along the way, that it is usually a good outcome when you are a little nervous or afraid. Diamonds are formed with the combination of high-temperatures and extreme pressure. In 2019, I will create more goodness by channeling my #BlackGirlMagic. Speaking of creation, the “creative” industry is one of the hot fields of the decade. Why? Because creativity is responsible for letting the imagination drive, for original ideas coming to life and producing artistic work. I look forward to using my #GiftofGab to tell stories of #BlackGirlMagic to celebrate black women who are shaping our future with resilience. Earlier this year, on my 31st birthday, I declared 2018 to be my year of winning. It’s been just that -- from switching careers, taking on a more senior role in a new industry, to marrying the love of my life -- this year has been incredible to say the least. As a child, I learned that education removed boundaries, provided avenues for success and provided financial stability in many cases. 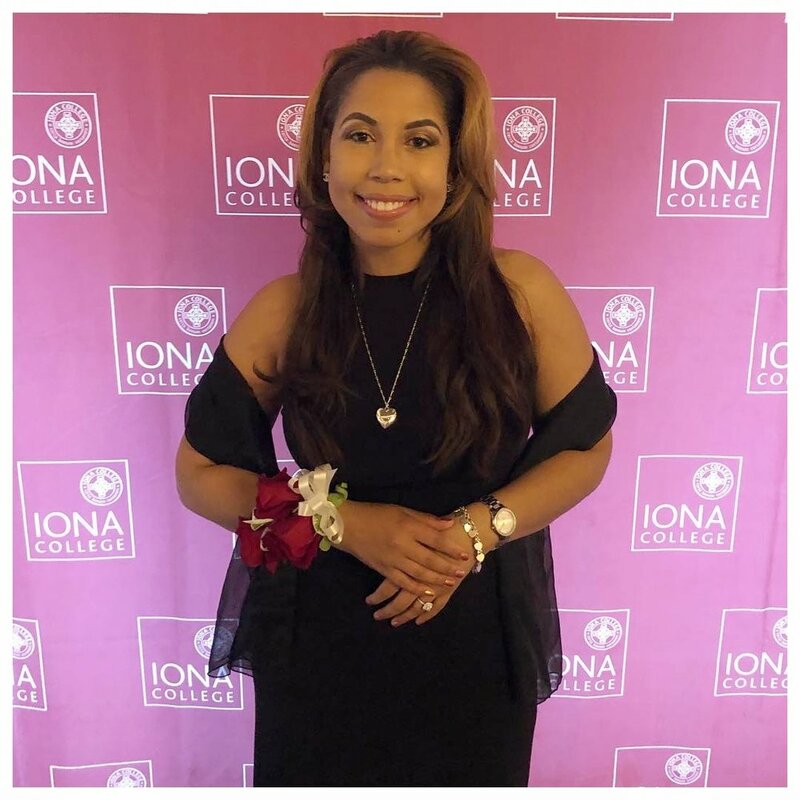 Since I obtained my masters degree at age 22, I’ve served as an adjunct professor at my beloved Iona College to St. John’s University to College of New Rochelle all the way to New York University (NYU). My current graduate professor role at NYU means so much to me, because in high school NYU was unequivocally my dream school, however I did not get accepted. Years later, NYU contacted me and offered me a professor role. NYU said that they would be honored to have me. Talk about time revealing it all! I absolutely love teaching. People often ask me what I do for fun and my answer is always, “teach!” Teaching is the most fun and rewarding role that I’ve ever had (though I imagine in future years, motherhood will change that :)). Now, working full-time in higher-ed as Vice President and Head of Communications and Marketing at the phenomenal Barnard College of Columbia University, has been beyond rewarding. Marketing communications, events, strategic, news, crisis and digital communications, media relations, creative design, video storytelling, as well as editorial are all under my purview. I am tasked with leading the College’s strategy in showcasing how amazing Barnard is and how it is truly singular. Barnard is one of the most selective colleges in the country and is devoted to empowering women. Uniquely, it has all of the academic resources of Columbia University. Alumnae include best-selling writers, novelists, journalists, playwrights, Pulitzer Prize winners, and poets. Barnard is one of the top national producers of scholars selected for the Fulbright Student Program. Grads have made their marks in government, arts, science, nonprofits and beyond. And when people are asking, where are women in STEM, 35% of Barnard’s class of 2018 were science and math majors compared to about 21% nationally; and about 30% of under-represented minorities are math and science majors, compared to almost one-quarter nationally. I will end my pitch by saying, the College offers joint degrees with Columbia University, Manhattan School of Music, the Juilliard School, and the Jewish Theological Seminary. Being the college sports fan that I am….Barnard is the only women’s college that offers NCAA Division I athletics through the Columbia/Barnard Athletic Consortium. When I walk around campus, I see women from so many different backgrounds and the diversity is truly refreshing and empowering. Oh, and my new role was featured in Forbes, absolutely a dream! D R E A M! Saving the best for last, I am so very proud to say that I am formally Gabrielle Gambrell (yes, Gabrielle Gambrell :), say that 5x fast). I married to my longtime love! 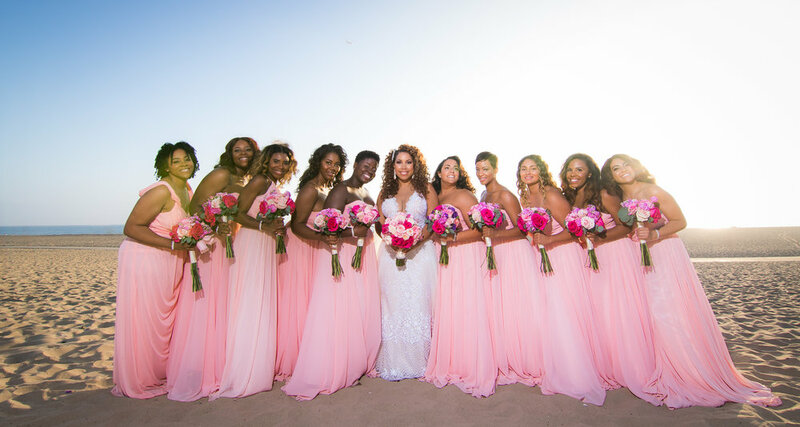 My wedding was beautiful and I am grateful for my 10, yes, 10 bridesmaids that got me down the aisle. As you can imagine, it wasn’t easy. Our drink menu was a hit! Everyone said the drinks were so tasty! Thankful for my bridesmaid April Johnson, who owns Happied, she made it happen! 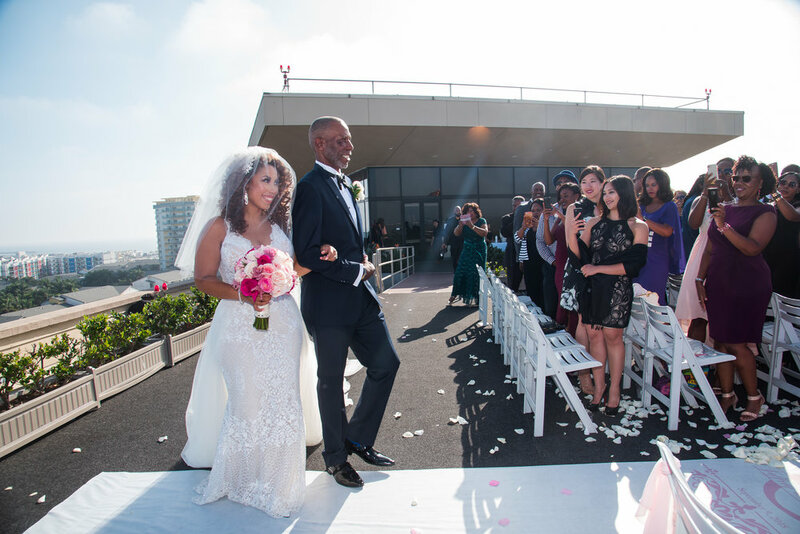 Our wedding took place in my hometown of Los Angeles on a rooftop in Marina del Rey overlooking a gorgeous 360 view of the city of angels. 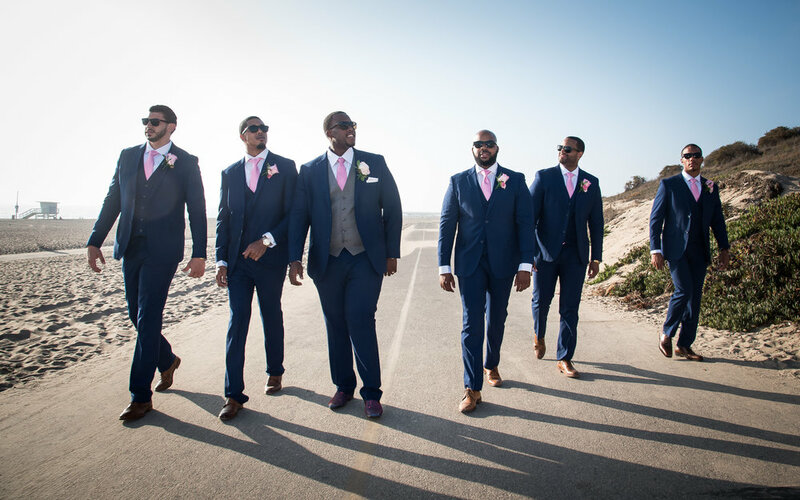 The wedding had a theme of “Broadway Takes Hollywood,” and featured live gospel, jazz and R&B performances. Our wedding paid homage to our love for the arts, as well as our hometowns of Los Angeles and New York. We had beautiful ice sculptures, vibrant lighting, Snapchat filters, that were posted on Instagram, a fabulous LA and NY themed signature drink menu, and more. Here are some photos in case you missed them on all of my social media platforms! Here’s to making the last few months of 2018 even greater! My time at FCB Global is coming to an end and it is indeed bittersweet. I can’t wait to share my new career news with you on Monday! What I am ecstatic about is that I’ll definitely keep in touch with my FCB family forever. From the top down, so many people positively impacted me as a person. In particular, something that I will cherish incredibly is that I met two dynamic black women who took me under their wings and mentored me (and most importantly, will continue to do so in the future): Cynthia “Cindy” Augustine, FCB’s Global Chief Talent Officer and Vita M. Harris, FCB’s Chief Strategy Officer. In my decade-plus career, I’ve never had two senior-level black women come together collectively to invest in my future on a daily basis. Yes, I have PHENOMENAL black female mentors who go above and beyond for me, but I have never had the pleasure of seeing them and shadowing them on a day-by-day basis, neither have I had a team of mentors at one place and at the same time. This has been life changing for me, being able to watch two dynamic, superb and powerful black women successfully engage, empower and lead global industry decisions. The marketing and advertising industries are not the most diverse; in fact there's a long way to go in terms of inclusion across the board, and for there to be two black women in a C-suite at a leading agency is profoundly inspiring. Cindy and Vita taught me the significance of having REAL support, guidance, and they continuously nurtured me. They took the time to invest in my success and foster my potential, and I can never fully describe how appreciative I am of both of them. But without a doubt, their training impacted me and will shape me in my new executive role, where I will be the first black woman to ever hold my title. FCB is engraved in my heart, and I will always be grateful for its invaluable contribution to my career. I am humbled to have worked at one of Ad Age’s 2018 Agencies to Watch, and I do not take it for granted. My FCB highlights include working with worldwide CEO Carter Murray, who is truly passionate about #TalentAboveAllElse and is such a gracious leader. Furthermore, learning what it means to be #NeverFinished from the gifted Susan Credle is something that I’ll forever cherish. Absorbing and learning firsthand from the brilliant and eloquent Brandon Cooke – who challenged me to think big, discover above and beyond what’s presented, and moreover, grow – has taught me so much. There’s nothing better than having a great boss, and Brandon’s a genuinely spectacular person. I am honored to have worked for him. This journey has been nothing short of amazing, from last year witnessing Area 23 rightfully claim Cannes Lions, “Healthcare Agency of the Year” to watching FCB Health dominate and bring home the 2018 acclaimed “Healthcare Network of the Year” honor. Under the impeccable Dana Maiman, whom I adore for her dedication to empowering talent and her graceful leadership, I have learned how to be intentionally inquisitive and authentic in my approach. Rich Levy — who tasks his creative team to think “What If?” to purposefully move the industry forward by leveraging assets and talent — has also shaped me as a leader. FCB has been the greatest team that I have ever been a part of. It has been both a privilege and an honor to work in marketing and advertising full-time at FCB Global. I will miss my talented and dedicated worldwide communications team, but there’s no doubt that we’ll all remain in contact.